It’s perhaps a little known fact that prior to the Civil War, black jockeys dominated the sport of horse racing. Pure Confidence by Carlyle Brown explores that world in Lower Depth Theatre Ensemble’s West Coast Premiere of a powerful and multi layered tale that explores the complicated relationship between master and slave. 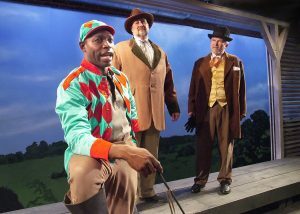 Simon Cato (Armond Edward Dorsey) is a cocky, confident and most winning jockey owned by two children who have inherited him. Through their lawyer, they lease Simon to Colonel Wiley Johnson (William Salyers) — a man Simon rides and wins for. The colonel’s horse is also the title of this play; Pure Confidence. Simon and the colonel have an understanding, a friendship of sorts, and the colonel and his wife begin to think of their jockey and rented slave as a distant family member. Simon begs the colonel to buy him from the children so that he in turn can buy his own freedom with money he hopes to win by racing. The colonel’s wife, Mattie (Deborah Puette) helps Simon put his plan in motion and even allows the Simon to buy her “girl,” Caroline (Tamarra Graham) on the condition that Simon marry her. These are forward thinking, modern minded people who are certainly out of step in their class conscious, racist world. The first act sees Simon achieve his dream. He gets his freedom, but by the second act Simon’s fortunes have changed. 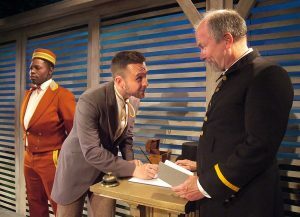 Injured in a racing accident, he has suffered permanent damage that prevents him from riding and now works as a bellboy for an abusive, racist hotel clerk (Eamon Hunt). His marriage to Caroline, though caring on many levels has also turned abusive. Simon vents his anger by hitting his wife. When a newspaper reporter (Dylan John Seaton) tracks Simon 15 years later so that he can write a story about the once great jockey, we learn that it was Colonel Johnson and his wife who hired the writer to locate their former jockey. 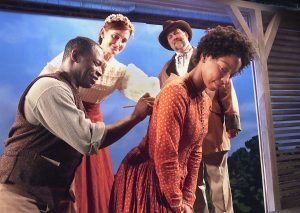 At a touching, heart-felt reunion, these two couples, one white and powerful, the other black and struggling, try to rekindle their prior relationship in the new age of Reconstruction, but they are thwarted by the social climate, ultimately having to acknowledge that it is not a level playing field, and a legitimate friendship between them is never to be. Staged in a black box at the Sacred Fools Theatre, this production is most impressive. Director, Marya Mazor has crafted a poignant piece that feels as real as it is disturbing. The set design by Tom Buderwitz and clever use of film and photo projections from Nicholas Santiago help give Pure Confidence a slick, almost off-Broadway feel. 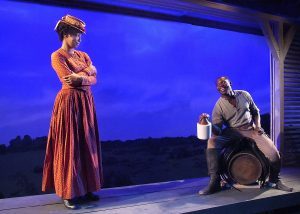 Kudos to Mylette Nora for her costume design that looks and feels so authentic. But it is the acting that makes this play well worth seeing. Armond Edward Dorsey is exceptional as the ambitious Simon. William Salyers ably unfolds Colonel’s mindset, letting us see the complexities of his character. Tamarra Graham as “Caroline” is both sensitive and fragile, but strong when she needs to be, while Deborah Puette as the colonel’s wife convincingly portrays a modern thinking woman from a troubled time. The rest of the cast, Eamon Hunt and Dylan John Seaton are both solid in their respective roles. Pure Confidence is a thought provoking drama that compels as it takes us back to an ugly chapter in America’s past. Its message is not only powerful – it may also move you to tears. 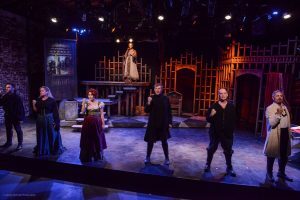 MICHAEL SHAW FISHER’S musical prequel to Hamlet, SKULLDUGGERY, currently playing at the Sacred Fools Theater in Hollywood, is an emancipation of one of history’s most epic stories. Fisher takes Shakespeare’s greatest play and extracts the core, bringing the characters to life in a most vibrant and colorful way. In particular, Fisher shines a light on Claudius, Hamlet’s uncle and the villain of the original story, showing us his human perspective. Skullduggery takes place years before the birth of young Hamlet. Claudius is a meek and poetic teenager when he and his brother, the imposing Hamlet Senior, meet Gertrude for the first time. Emotions run high among the three youngsters and an attraction between Claudius and Gertrude is apparent. With the kingdom is on the brink of war swift choices must be made. Claudius’ sickly demeanor makes him more of a battlefield liability than a viability and he is soon left behind while Hamlet and their father, known only as “The King,” leave for war. Seven years later Hamlet Senior returns to Elsinore and takes Gertrude as his bride, leaving his brother nursing a broken heart. Time passes. Chaos ensues and the country is forced to reconcile with the new, warmongering king. 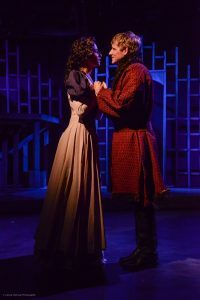 While this may sound dark and gloomy, Skullduggery is also a light-hearted musical romp with songs such as “Never Trust A Ghost,” “Girl Talk” and “Snake In The Garden.” The play attempts to reveal answers missing from the original Hamlet. What really happened to Yorkick? What fate befell Ophelia and Laertes’ mother. The skeletons in Shakespeare’s masterpiece all come come out to play and ultimately, Claudius is faced with his most difficult decision. To kill or not to kill? JOHN BOBEK as Claudius convincingly transforms from a poetic teen, filled with puppy love, to a murderous villain and the nemesis of Shakespeare’s classic play. DAVID HAVERTY creates an ominous force as Hamlet Senior, while LEIGH WULFF’S brilliant and melodic Gertrude brings them together and helps to reveal the humanity in the villain. 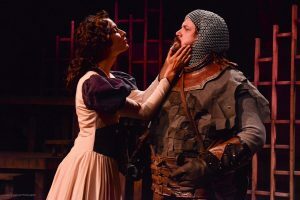 JOE FRIA (substituting last week for Brendan Hunt) as Yorick is a stunt-laden spectacle while CURT BONNEM as Polonius and REBECCA LARSEN as Berta, bring a lighthearted, comedic essence to the production. The Scenic Design by DEANNE MILLAIS and the costumes by LINDA MUGGERIDGE bring character and a sense of reality to the incredible story. Fisher’s intelligent play, (he wrote the script and the music), SCOTT LEGGETT’S sure handed direction, NATASHA NORMAN’S fluid choreography and MICHAEL TEOLI’S impressive musical direction, (leading a tight 10 piece band), make Skulduggery a not to be missed theatrical event. It’s a Broadway worthy production right here in our own backyard. WHEN: Fridays and Saturdays at 8pm, Sunday Matinees at 3pm. Ending November 5.